Forecast.io is web service that provides weather data for a given latitude and longitude. Installing Ionic is quick and easy. To get started, I’ve summarized the installation steps below. You can find additional information here. First, download the build of Node.js appropriate for your platform and install it, if you don’t already have it on your machine, that is. This should install NPM (Node Package Manager) as well. Ionic runs on Linux, Mac OS X and Windows, but you’ll need to use the command line to create the app, add platforms and launch the app in an emulator or a device. For Windows users, git bash is a better alternative to the platform’s command prompt. More details can be found right here. Ionic framework should now be successfully installed on your machine. Now let’s create an app. From the terminal, go to your project folder. Type the following command to create a blank app with tabs. Simply replace tabs in the above line with blank or sidemenu to create a blank app, or an application with a side menu. That’s it! In a few lines, we’ve installed Ionic and quickly created a starter app. It doesn’t really do much at this time so let’s get to work. 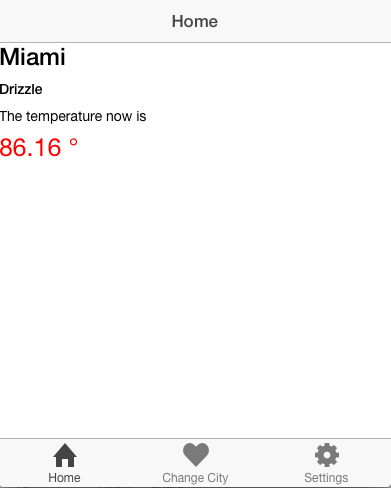 We’re building a simple app that displays current weather data for a selected city by pulling data from Forecast.io. Our app has three pages. Page one displays the current temperature and weather conditions for a default city. The second page contains a list of cities. Selecting one of these cities will display its weather details. While the third page is a placeholder for storing app settings, we won’t be covering them in this tutorial. Before we begin, head over to Forecast.io and signup as a developer to get your own API key for use with this walkthrough. The application should look like the image below when we are done. So, let’s get started. Navigate to the folder www/templates from your application root directory. This folder contains template files that will be rendered for the app. Since we opted to use the tabs style starter app, Ionic has created some files in this folder. To make things a bit easier, let’s modify the generated files slightly to suit our needs. Replace code in tab-home.html with the code below. Here we’re displaying the weather data for the current city. Current is a scope item that contains weather data returned from Forecast.io. Save your changes. 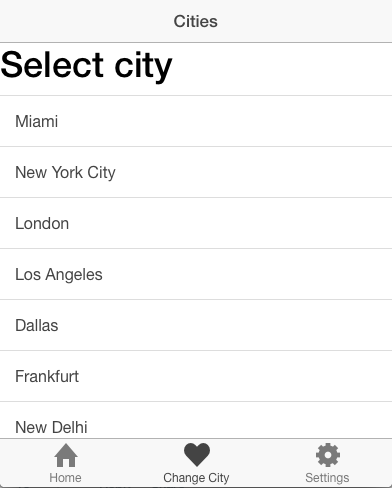 Next, open tab-cities.html and replace the code inside it with the code below to display a list of cities using ion-list. Next open tabs.html. This contains code that defines the tabs that appear at the bottom of all pages. Replace the code inside the file with the code below to link the tabs with the view templates we just modified. Next, let’s define the routes. Open js/app.js and replace the code with the lines below. After defining templates and adding routes, we’ll create controllers. Open js/controllers.js and replace the code inside it with what’s below. Home: Defines two scopes, city and current. Current is data returned from an API request. City names are retrieved from DataStore factory. Here we’re calling the method ‘getCurrentWeather’ defined in factory ‘Weather’ passing in latitude and longitude. Lastly, let’s take a look at js/services.js. This file defines services and factory objects. Factory objects allow different controllers to share the same data. We have to make on last change before we can see the app in action. Navigate to the “www” folder and open index.html. Now, add the following after the line above. You can also view the app in a browser. If you don’t have web server installed, you can use Python’s SimpleHTTPServer. From the terminal, navigate to the “www” folder and run the following command. Now, open your favorite browser and visit http://localhost:3000 to see the app running. In this article, we saw how to get started with Ionic, an advanced HTML5 framework for hybrid app development. In future articles, we’ll take a look at enhancing the app by adding support for a remote backend with Parse.